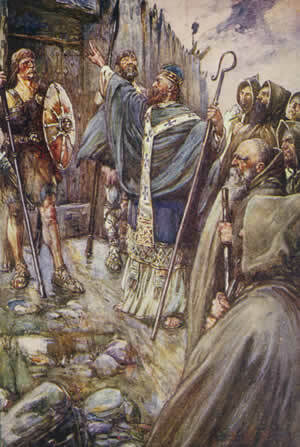 Ireland was never ruled by them as a politically unified state, as the High King was conceived of as an overlord exercising suzerainty over, and receiving tribute from, the independent kingdoms beneath him. Ireland in the Later Middle Ages. Boydell Press. p. 11. ^ Loughlin, Annie. "Gessi and Buada". tairis.co.uk. Retrieved 14 October 2017. ^ Revd. Dr. JH Todd, Cogadh Gaedhel re Gallaibh, London, 1867 ^ Roger Chatterton Newman, Brian Boru, King of Ireland, Dublin, 1983 ^ "The Annals of Ulster". Ucc.ie. Retrieved 23 May 2012.